Our story began 20 years ago with wealth of in depth expertise in professional hair colour and hair care sector where we exported hair care brands to overseas markets. Our operation in domestic UK market complimented our work with the input of second generation of human skills and under the banner of Kazem we became platform for quality Italian hair products to salons and professionals at trade prices. In 2008 due to higher demand for our brands and in order to maintain efficiency we relocated our office to Central London where we are easier to reach and provide a face to face service to clients. Our cosy store / showroom is just outside the Congestion Charge area at the heart of London from which we have helped many independent salons and stylists with means and resources to expand and overcome financial constrains in supplying them with technical products, lower operational costs and bespoke furniture designs. In addition over the years our clients have helped us grow in to technical hair treatments, retail hair care, electronic, barber and shaving as well as Italian furniture. Our products remain professional whilst prices small. With growth our name reflects a face to face approach with strong customer consciousness that thrives to provide the same friendly approach and flexibility that got us here since the beginning. 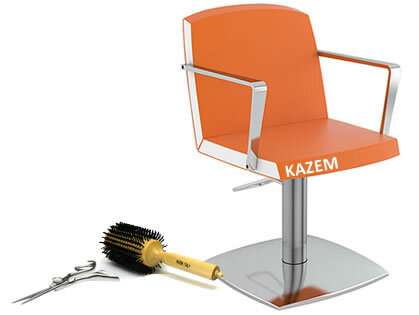 Kazem limited has participated in Salon International Exhibition in Excel, Cosmoprof Bologna, Cosmo pack Asia and Dubai. we work in partnership with several overseas companies to deliver the latest trend setting products and hairdressing technologies at the lowest cost benefit ratio to clients. Our catalogue and online e-shop provide a faster and more informative platform for clients and salon managers. And the same friendly team are dealing with both channels and orders. Feel free to contact us to share in your success story.